Joanne Sakelaris was so afraid of spiders that she sealed her house with masking tape each night. She worked the graveyard shift for 23 years in the field of computing and robotics, which she sought out because "it offered the most sterile atmosphere." Before heading to the office she would set off bug bombs in the cab of her pickup truck. "People there would say, 'Have you been spraying yourself with Raid?'" she recalls. Ms. Sakelaris became unusually adept at spotting spiders. Twice, after spotting a tiny spider in her truck, she swerved across four lanes of freeway and had to be calmed down by highway police officers. She had tried every remedy that her psychologist, who specialized in the inordinate fear of spiders, could think of to lessen her fears. In SpiderWorld, Ms. Sakelaris could not only confront spiders but also chase them around the house, into the sink, and down the garbage disposal, where she could eliminate them with a switch that she controlled. 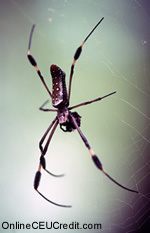 One reason that SpiderWorld helps arachnophobes to overcome even crippling terror is that its visitors have no reason to fear being bitten or even touched by a spider. No real spiders live there. SpiderWorld is a virtual-reality environment created by Hunter Hoffman, a cognitive psychologist at the University of Washington's Human Interface Technology Laboratory here. He and other researchers at the lab hope to develop virtual-reality methods to help people conquer phobias as well as traumas inflicted by life. The technology creates computer simulations of their fears, or images designed to soothe people's fear by distracting them. Virtual reality holds great promise for treating phobias, says Mr. Hoffman, because it permits a degree of control of anxiety that is far harder to attain in traditional "immersion" therapy, in which people are placed in the actual situations that terrify them. The virtual techniques already have been used, here and at a few overseas clinics, to address acrophobia -- the fear of heights -- taking advantage of the greater ease of working in virtual conditions than in a real-world setting. The technique works best not on the most suggestible people, but on those most able, or willing, to suspend skepticism about the make-believe world they are entering, says Albert Carlin, a psychologist in private practice who has retired from the University of Washington and specializes in anxiety disorders and phobias. "The more you do that, the more real it becomes." In Ms. Sakelaris's case, the technology has had real results. After a couple of sessions in the lab, she found that her eyes had stopped flitting about, in a desperate search for spiders, every place she went. After a few more visits she was able to touch handrails when walking on stairways. Now she has even started gardening. The explanation for her escape from fear lies back inside the electronic world, best experienced in person. "Here, slip these on," says Mr. Hoffman to a visitor in the Seattle lab. On goes a virtual-reality glove, with which the wearer maneuvers through the lab's virtual spaces. Then there's a helmet, within which two miniature monitors change the scenery as the user's head moves. The images are carried by fiber-optic cables that run from the eyepieces to computers. Into the frames comes a hairy and forbidding, if somewhat cartoonish, spider that scuttles across the virtual terrain. "OK, now reach out and touch the spider," Mr. Hoffman, with some glee, instructs the visitor. Suddenly a large, furry, hairy object is palpably in the hand. "I didn't think it was going to work, I really didn't," says Ms. Sakelaris. But as soon as she began her sessions with Mr. Hoffman, she began to dream about scaring the virtual spider away. "I didn't crumple to the floor when I encountered a spider," she says. "It was amazing. It literally changed my life." Of course, it did take some practice. Her reaction the first time she entered SpiderWorld was her most memorable. Ms. Sakelaris had not been warned that she would be handed an actual toy spider, exaggeratedly hairy and creepy. The software malfunctioned, and the virtual beast of SpiderWorld jumped up at what she thought was her face. She, in turn, leaped so high -- on her way out the door -- that she sent the virtual-reality equipment flying. It took Mr. Hoffman a week to restore it. That's when Mr. Hoffman dubbed her "Ms. Muffet," the pseudonym by which she is known in his publications about the research. As terrified as she had been at the spider's unexpected approach, though, Ms. Sakelaris was even more astonished by how quickly SpiderWorld calmed her fears -- once Mr. Hoffman and Mr. Carlin had persuaded her to come back and try the technique again. By her third hour in the virtual environment, she says, her anxieties were greatly eased. After 10 sessions she could barely believe it when her psychologist, Mr. Carlin, told her that she was cured. It was a call from Mr. Carlin that got Mr. Hoffman thinking about a virtual-reality approach to treating arachnophobia. Some research had already suggested that phobias were amenable to the technique, so the two men began to experiment to find out what made it work best. It was already well known that treating phobias requires that patients experience anxiety during the treatment. They then can use their memories to gain access to the process that produces their fears, and eventually to control the process. Exploiting such access was what prompted the researchers to add tactile augmentation to SpiderWorld. The subjects' touching the hairy toy spider, they found, doubled the program's effectiveness, which was measured by how close the subjects could subsequently come to a real spider -- a truly arresting species known as the Goliath bird-eating spider -- eight inches wide from legtip to legtip -- so named for its occasional theft of chicks from nests. Mr. Hoffman used to handle them, but they have become rather testy, he says, and he is now afraid to pick them up, for fear of their considerable bite. Mr. Hoffman keeps two of the tarantulas in an office next to his lab. "The tactile augmentation seems to blur the distinction between real and virtual," he says. "That helps to increase the transfer from the virtual world to the real world. It's fascinating. People sweat when they move the cartoon spider with this Mickey Mouse hand." He and Mr. Carlin say SpiderWorld works not only because it appeals to patients who are too afraid to confront actual spiders, but also because it gives both therapist and patient control over the context of the fear. "Spiders," says Mr. Hoffman, "can terrify even people who are well-adjusted and highly functional, except for their phobias." Research has shown, however, that in the Western world the response is due not to any evolutionary cause, but to the anxieties provoked by spiders' cultural and historical associations with contamination, disease, and biting. "Arachnophobia is good to work with because it's fairly common, and you can have dramatic effects in people's lives, and there's little shame attached to it," he says. Another benefit of SpiderWorld, he adds, is that it provides control over the scary beasts: "It's almost impossible to get real ones to do what you want them to." The preceding section contained information regarding the use of virtual reality in the treatment of phobias. Write three case study examples regarding how you might use the content of this section in your practice. How does touching the toy spider while a client is in SpiderWorld affect their treatment process? Record the letter of the correct answer the CEU Answer Booklet.